Robotic Laser cutting and welding is one of the fastest and most efficient processes. Our laser cutting and welding systems have endlessly-rotating 4th and 5th axes, making this one of the most flexible systems on the market today. 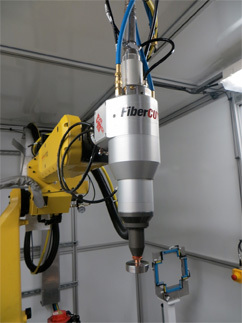 The CO2 laser works by first emitting an invisible beam of light that is either 9 mm in diameter (if it is a 300-watt laser) or 12mm in diameter (if it is a 600 watt laser). This large light beam is then passed through a manufactured focus lens, which focuses the beam of light to a near pinpoint size. The robot then guides this pinpoint of energy around the area to be trimmed or scored. The trimming (or scoring) takes place as the laser energy sears the part. Our laser cutting systems are ideal for trimming plastic automotive components such as pillar moldings, door moldings, trunk moldings and outer panels. The laser can cleanly trim nearly all types of plastics (including PP, PE, ABS-PC, Perspex, TPO and PVC), paint films and textiles. Your company’s partnership with TBD Enterprises enables your business’ forward movement with the Power to Transform® scalable technology. We support systems applications with trouble-free, highly efficient and lower risk laser capital equipment purchases. Our partners highly experienced technology team will work with you to customize your system configurations to assure you have the optimal solution that matches your volume requirements or difficult challenges. Contact TBD Enterprises for more information on Dispense systems.